David Evan Jones (born January 4, 1962) is an American politician who served as California's Insurance Commissioner from 2011 to 2019. He previously represented California's 9th assembly district from December 2004 to 2011 as a member of the Democratic Party. Jones attended Carl Sandburg High School in Orland Park, Illinois where he served as student body president alongside student body vice-president John Chiang. Lifelong friends, Chiang and Jones would run again together in 2010 on the California Democratic slate, with Chiang winning reelection as state controller and Jones being elected California Insurance Commissioner. Prior to his election to the State Assembly, Jones was a member of the Sacramento City Council, representing the 6th District which includes much of Southeastern Sacramento and the College Greens neighborhood in East Sacramento. He served for five and a half years after winning a 1999 special election to replace Darrell Steinberg, also his predecessor in the Assembly. Before his election to the city council, he worked for six years as a legal aid attorney with Legal Services of Northern California, providing free legal assistance to the poor. In 1995, Jones was one of 13 Americans awarded a White House Fellowship. Jones served in the Clinton administration for three years. He first served as a special assistant to Janet Reno and later as her counsel. Jones received his undergraduate degree from DePauw University, his law degree from Harvard Law School, and a Master of Public Policy degree from Harvard's Kennedy School of Government. Jones, a Democrat, chaired the Assembly Judiciary Committee for four years. He also chaired the Assembly Health Committee and the Assembly Budget Subcommittee on Health and Human Services. He served on the Appropriations Committee, the Judiciary Committee, and the Accountability and Government Review Committee. Reforming California's conservatorship laws, enacting sweeping protections for seniors and dependent adults facing abuse (Assembly Bill 1363 of 2006). Preventing HMOs and health insurers from charging men and women different rates for the same health insurance policies (Assembly Bill 119 of 2009). First-in-the-nation legislation allowing Californians to share their personal vehicles in car-sharing pools without invalidating their auto insurance (Assembly Bill 1871 of 2010). Securing billions in federal funding to improve California's hospital health care safety net and fund children's health care, by establishing a hospital provider fee (Assembly Bill 1383 of 2009). Protecting private medical records from mis-use (Assembly Bill 1298 of 2007) and disclosure (Assembly Bill 211 of 2008). Creating the nation's largest early childhood education and preschool program to give children the best possible start (Assembly Bill 2759 of 2008). Jones also authored legislation in 2010 which sought to regulate pet insurance by requiring pet insurance companies to be more specific about which types coverage will be provided. The bill was vetoed by Gov. Arnold Schwarzenegger and did not become law. Jones was mentioned by several people as a potential opponent for Mayor Heather Fargo in 2008 due to his experience in local politics. However, Jones decided not to run and endorsed the mayor in her unsuccessful reelection bid against former NBA star and non profit director Kevin Johnson. 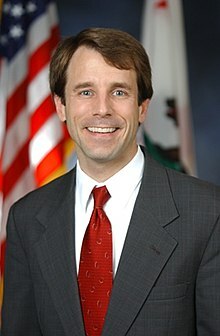 On November 13, 2008, Jones announced his campaign for California State Insurance Commissioner in 2010, a statewide elected office. Republican incumbent Steve Poizner was expected to run for Governor. Jones announced, "The insurance commissioner should be a strong advocate for consumers. I think with my background and experience, I would be a very strong advocate." He was quickly endorsed by State Senate President Darrell Steinberg and State Controller John Chiang. Jones' main opponent in the Democratic primary was Los Angeles Assembly Member Hector De La Torre. Jones won the Democratic Party endorsement by receiving just over 60 percent of the delegate votes at the California Democratic Party's convention in Los Angeles on April 18, 2010. Jones defeated De La Torre in the Democratic Primary. Jones won 3,544,003 votes in the general election, defeating Republican State Assemblyman Mike Villines, who received 2,650,383 votes. During the development of the health benefit exchange in California, Jones lobbied to exclude providers from the small business portion of the exchange that he felt charged unreasonably high rates. In particular, he worked to exclude Anthem Blue Cross and Blue Cross of California from the exchange. Anthem Blue Cross ended up withdrawing its participation in the small business portion of the exchange,  prompting concerns that consumers would not be able to comparison shop on the exchange itself where plan designs were standardized, but would be required to compare exchange plans to externally marketed plans. Jones subsequently claimed that other major carriers on the exchange were charging unreasonable rates including Blue Shield of California  and United Healthcare. United Healthcare subsequently withdrew from the California individual market entirely. Blue Shield currently remains a member of the exchange. Jones was re-elected to a second term in 2014 with 57 percent of the vote against Republican Ted Gaines, a state senator from Northern California. Jones and his wife, Kim Flores, live in the Curtis Park neighborhood of Sacramento and have two children, Isabelle and William. ^ Leubitz, Brian. "Dave Jones Gets Endorsement, No Endorsement in LG". Calitics. Archived from the original on 2010-11-20. Retrieved 2010-11-18. ^ Terhune, Chad (May 22, 2013). "UnitedHealth, Aetna and Cigna opt out of California insurance exchange". Los Angeles Times.